What are the different types of non-destructive testing methods? The application of non-destructive testing methods is critical to a range of different industries. We have completed hundreds of non-destructive testing tasks for numerous buildings on both large and small scales. 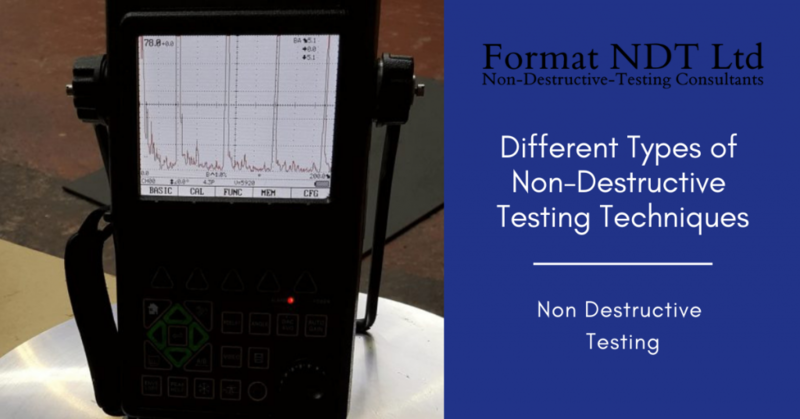 Format NDT can undertake a wide range of tests from large civil engineering structures to small components, welds, castings etc in traditional or non-traditional materials. All our on site or testing within laboratories is carried out by our team of accredited test engineers. We work in accordance with all recognized British, European and International standards. We offer a range of different non-destructive testing services, and you’ll find these outlined in more detail here. Ultrasonic testing is a non-destructive test method which utilises sound waves in order to detect cracks and defects in parts and materials. Ultrasonic testing can also be used to test how thick a material is, for instance the thickness of a wall pipe. This type of testing can produce images in a much more clearly defined way than other methods and highlight particular characteristics of materials at a range deeper than surface level. There are two different ways to assess parts using ultrasonic testing, contact or radiographic testing. Ultrasonic inspection uses electronic transducers. These transmit high-frequency sound waves to a material. The sound waves then send back very clear images that can reveal the characteristics of a material’s properties. They can indicate cracks, weld grooves and fractures. They can also show the thickness of a material and any moving components. If radiographic testing is not available, then contact testing may be possible. Contact testing only requires access to one side of the test material. It is portable and allows for inspection of parts that are large, irregularly shaped, or that cannot be transported. Liquid Penetrant Inspection is a technique used to detect surface breaking flaws. It sometimes goes by the name of Dye Penetrant Testing. It is a cost-effective method of testing used to identify surface breaking flaws such as cracks, porosity, laps, seams and other surface irregularities. It can be used with both ferrous and non-ferrous materials and all non-porous materials whether they are metal, plastic or ceramic. When testing in the laboratory, liquid penetrant inspection is extremely useful for the inspection of batch quantities of machined parts, and components that weight up to one tonne and are two metres in height. It is also used usefully on site, as it is portable and if applying a technique such as visible colour contrast there is no need to use any power or use water. It makes it a convenient non-destructive testing method for inspecting surface discontinuities. This is oldest method of inspection. It involves simply looking over a piece of equipment to assess for flaws. It needs nothing more than the trained eye of an inspector. It can be used for internal and external surface inspection of many different types of equipment including storage tanks, pressure vessels and piping. Positive Material Identification refers to testing materials in order to determine the chemical composition of a metal or alloy at various stages of the manufacturing process, or during in-process alloy installation. Understanding the exact composition and grade of an alloy means that suppliers, plant workers, and other responsible parties can match alloy specifications chosen for their specific properties whether this is heat resistance, corrosion resistance, or durability. Making sure the right alloy is in place is essential for places such as petroleum refineries and chemical plants, as this is sometimes all that stands between a safe operation and a dangerous one that loses both time and money. Ferrite testing is an accurate way to measure ferrite content in austenitic and duplex stainless steels. Having the correct ferrite content makes sure there is a balance between the ductility, toughness, corrosion resistance and crack prevention of a component. Correct ferrite testing and measurement can also help to avoid solidification, cracking and corrosion in stainless steel welds, pipes, plates, pressure vessels and other petrochemical components. If ferrite content is too high, then it can cause stainless steel to lose toughness and ductility. It can also become less resistant to corrosion. If ferrite content is too low, then stainless steel welds can crack when they become hot, or crack on sustain solidification cracks. A deficit of ferrite content in duplex stainless steel welds can mean welds lose strength and contribute to stress corrosion cracks. Measuring hardness can be done in a variety of different ways. Hardness tests as a method are therefore dependent on the outcome needs of each test, in order to determine the kind of hardness testing used. They are used to characterise a material and to identify if it is suitable for the use it is intended for. They involve the use of an indenter that is harder than the material it is testing. This indenter is pressed onto the test surface with a certain level of force. The size of the depth of the indent is measured in order to determine how hard a material is. This makes hardness tests beneficial in a range of different industrial applications. Radiographic Testing is a non-destructive testing technique using either x-rays or gamma rays to view a component internally. For instance, in the petrochemical industry, it will be used to inspect machinery to detect flaws. It can also be used to inspect weld repairs. It is advantageous as it can be undertaken on a range of different materials, and data can be stored to analyse at a later date. Radiographic systems are also portable which means they can be used on site and also in elevated positions. Conventional radiography: This utilises a sensitive film which then reacts to emitted radiation in order to capture an image of the part which is being tested. The image can then be examined for damage or flaws. However, films can only be used once, and they can sometimes take a while to process and interpret. Digital radiography: This doesn’t require film. It uses a digital detector in order to display radiographic images on a computer screen. These will appear almost instantaneously. These images are often much higher in quality than other radiographic images. Therefore, this technology can be used to identify flaws in a material. It can also be used to check for foreign objects in a system, to examine weld repairs, and inspect for corrosion under insulation. The benefit of a choosing Format NDT to undertake non-destructive testing means you’ll get experience and high quality service from a company who truly understand the complexities of the industry. We work quickly and professionally so that you get the results and information you require as soon as possible. Format NDT’s workers have a wealth of experience and can offer non-destructive testing to a range of different industries. Contact us today for more help and information. NextWhat Is The Purpose Of Carrying Out a Non-Destructive Test?